Editor's Note: Unfortunately we can't shrink our submarines down to fit into the recesses of our bodies. 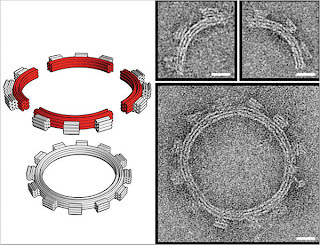 We have to build the parts and assemble them in nanoscale. That's quite difficult, but researchers are finding ways to do it, as described in this fascinating article. A 12-tooth gear, about one-tenth of a micrometer in diameter, assembled from strands of DNA. You can’t build a machine without parts. That’s true for large machines like engines and pumps, and it’s true for the tiniest machines, the kind that scientists want to build on the scale of molecules to do work inside the body. Researchers at the Dana-Farber Cancer Institute and Harvard University have taken a step toward creating parts for molecular machines, out of DNA. In a paper in Science, Hendrik Dietz (who is now with the Technical University of Munich), Shawn M. Douglas and William H. Shih describe a programmable technique for twisting and curving DNA into shapes. Dr. Shih said the method used strands of DNA that self-assemble into rigid bundles, with the individual double helixes joined by strong crosslinks. Manipulating the base pairs in the helixes — using more or fewer of them between crosslinks — creates torque that causes the bundles to twist and bend in a specific direction. The researchers were able to control the degree of bending, and were even able to make a bundle bend back on itself.